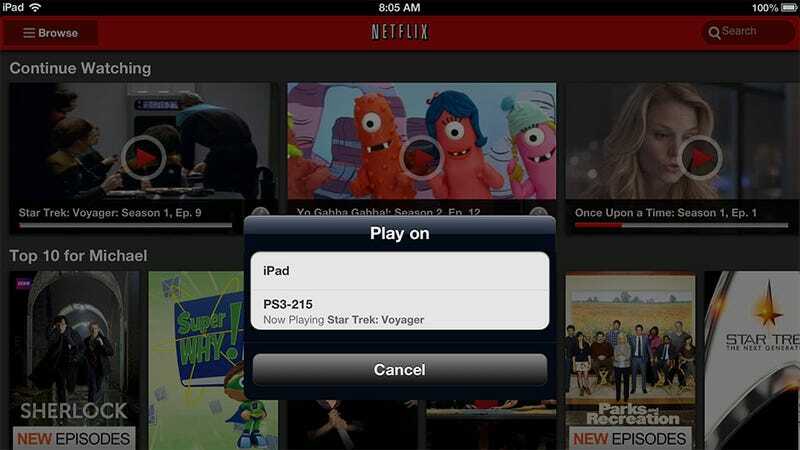 Have you updated the Netflix app on your iPhone, iPad or Android device lately? Try firing it up when your PlayStation 3 is on the Netflix menu, and you'll discover a nifty new way to control the console version of the streaming video service. As long as the Netflix app on my PlayStation 3 is open, opening a show on my iPad or Nexus 7 tablet gives me the option to play it on the device itself or via the console. Choosing console launches a window on the device that allows me to adjust audio and subtitles, change episodes, and jump around the video via a navigator bar. Yes, I am watching Voyager. Shut up. The trick, which I discovered via the fine folks at Engadget, effectively gives the PlayStation 3 the same remote Netflix control enjoyed by users of Microsoft's Xbox Live Companion app for the 360, and seems similar to the functionality Wii U users will enjoy between console and Game Pad come November 18. I used to use Netflix exclusively on the Xbox 360, as I can just shout at the Kinect from across the room while I am working. This is a much more elegant solution. I think I'll keep it.